Nowadays, there are many options which can make your cat’s eating experience a lot more enjoyable. This includes water fountains which provide a more exciting way for your cat to drink and saves you from having to replenish their water bowls as frequently. The main advantage of having a water fountain for your pet is that they are said to entice pets to drink more water, and this can have many health benefits for your pet in the long run. If you haven’t purchased a water fountain for your little furry friend before, you may not know which one is best for your cat’s needs. In this article, we will discuss 3 of the best cat fountain styles for your cat to enjoy. The first option on our list is the fountain by Catit. The Catit Water Fountain is a great product your cat is sure to enjoy. This little fountain comes with 3 different water flow settings, allowing your car to try various drinking options. We will take a look at its features below. Catit have designed a fantastic water fountain your cat(s) will love. This product is also BPA free so you don’t need to worry about your cat coming into contact with any harmful chemicals. The design of the Catit fountain makes for a fun experience for your cat. The water streams in not 2 but 3 different styles and your cat will be able to enjoy various drinking styles. The best thing about this fountain is that there is a triple-action filter which helps to prevent any urinary tract diseases in cats. This works by removing magnesium and calcium from tap water which can commonly cause problems for cats. With the Catit fountain there is continuous filtration as the opaque reservoir works to keep the water fresh for a longer time. This means your cat can always drink fresh and you don’t need to worry about replenishing a water bowl as often. The next pet fountain featuring on our list is the PetSafe Drinkwell fountain for both cats and dogs. This is another great fountain which features a built-in reservoir. We will take a look at its key features below. PetSafe aims to strengthen the bond between you and your pets, and their product has been designed with this in mind. Their easy to clean fountain is designed to encourage your pet to drink and also offers a quiet operation. When your pet drinks water, you want to know they aren’t consuming any harmful bacteria which could later cause stomach problems. With the PetSafe Drinkwell, you don’t need to worry; this fountain includes a replaceable carbon water filter that removes all bad tastes and odors as well as any bacteria, helping to keep the water fresh. The fountain also features an adjustable stream which you can customize to your pet’s favorite drinking setting, giving them more pleasure every time they go for a drink. The free-falling stream entices pets to drink more water. The built-in reservoir increases overall water capacity and extends the time between filling and refilling the fountain, lessening the worry of your per running out of water. The third and final pet fountain featured on our list is the Mospro Cat Water Fountain. This is another nicely designed water fountain which is perfect for cats and dogs. We take a look at its special features below. Do you want a water fountain that is environment-friendly and which your cat will love? Then the Mospro fountain is certainly a product for you. This cat water fountain is made with antibacterial resin materials, which have been finely polished to give them a sleek appearance. This is also a BPA-free product which has no toxic materials and is also odorless. It also features food-grade certification which means it can be used safely. The cat water fountain also features 3 different water settings, ranging from flower waterfall, flower bubble and finally a gentle fountain setting. This gives your pet the opportunity to enjoy several drinking styles. 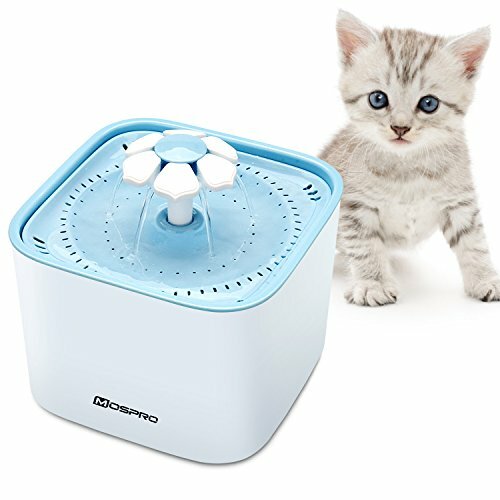 Which Cat Fountain Is Best For Me? The cat fountains featured on our list are sure to provide your cat with a more exciting drinking experience. If you are shopping on a budget, you may be more interested in finding a more inexpensive fountain. The three fountains we have mentioned are fairly inexpensive, however the cheapest option is the Mospro water fountain, which is fantastic for the environment-friendly quality. 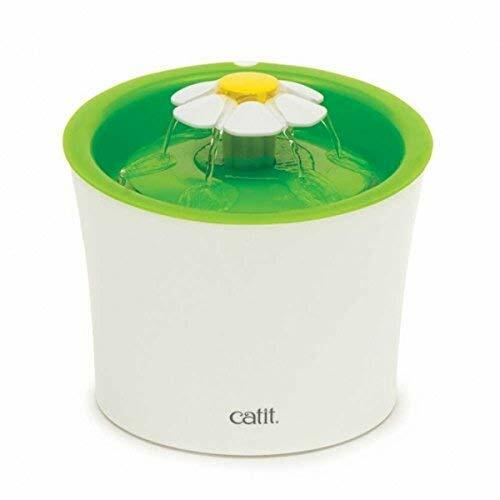 The second most inexpensive fountain is the flower fountain by Catit, which is also a great fountain for the price. 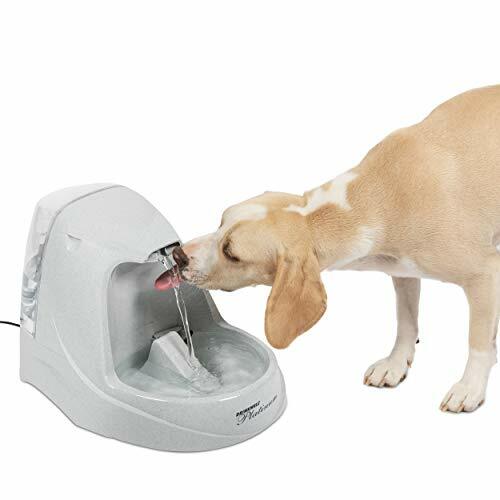 So there you have it – 3 different water fountains which can provide a new and exciting drinking experience for your pet. Which do you prefer? We hope this article has helped you in finding the most suited one for your cat.